Please click on the image on the left or the link below to read the Statutory Warning issued in Public Interest by Rehabilitation Council of India (RCI), which is a statutory body of Ministry of Social Justice & Empowerment, Govt. of India. This Statutory Warning has also been displayed between pages 48 & 49 in the Souvenir released in the 19th National Conference of Orthotics & Prosthetics Association of India (OPAI) held on 12th-14th February 2010 at New Delhi. 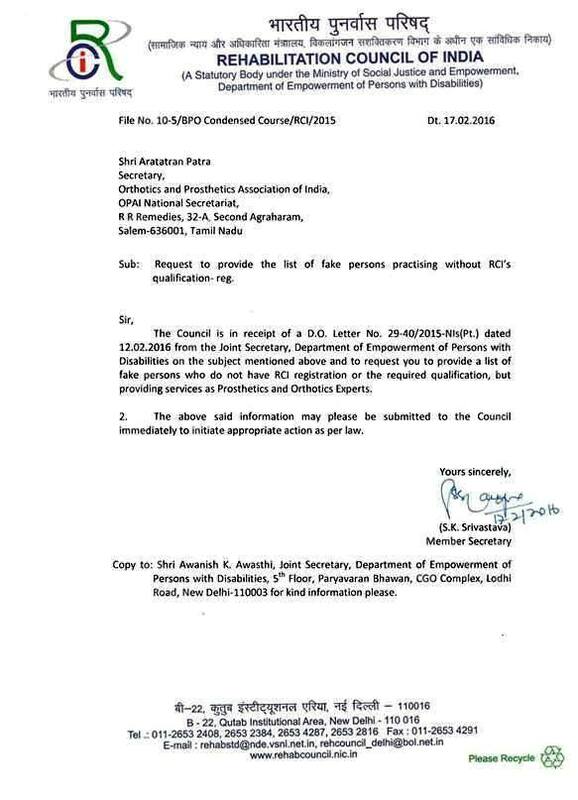 Unqualified persons cannot practice as Rehabilitation Professionals anywhere in India, and they are not eligible to work in Government or private sector. Unqualified persons found serving the disabled persons without RCI Certification should be prosecuted before the Court of Law under section 13(3) of RCI Act, 1992. RCI should issue more statutory warnings through print & electronic media on regular basis and also statutory warnings should be directly issued to all Govt. institutes, NGOs, clinics and chemist shops etc. 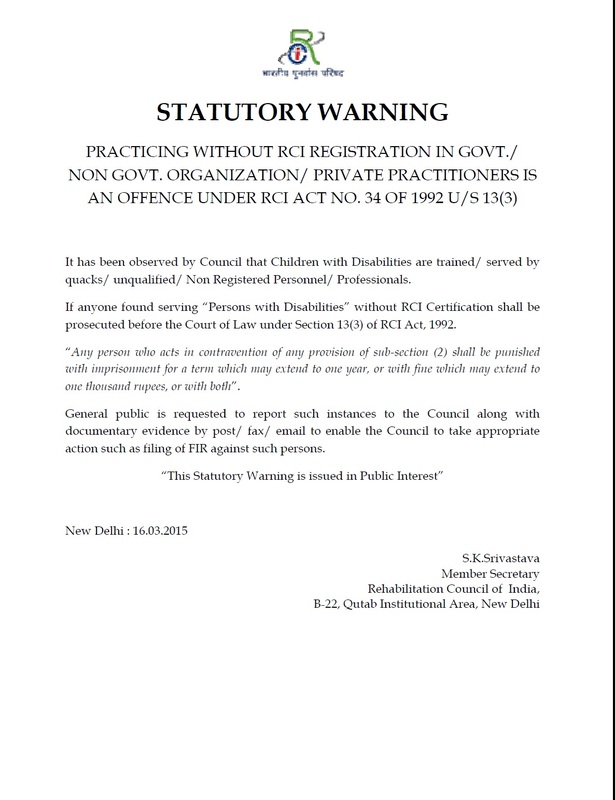 Where unqualified persons/quacks are serving the Persons with Disabilities, these institutes & NGOs and the quacks should be prosecuted u/s 13(3) of the RCI Act in the court of law, that is before the court of Chief Commissioner for Persons with Disabilities (PWD). Through the Court of Chief Commissioner for Persons with Disabilities order dated 15 May 2008 (to see this order click here), has already directed the Medical Council of India (MCI) and Indian Medical Association (IMA) to resrict the doctors to treat only the medical illness/disease of children (persons) with disabilities, and further directing that these persons should be referred to qualified Rehabilitation Professionals for appropriate rehabilitation / therapeutic assistance. 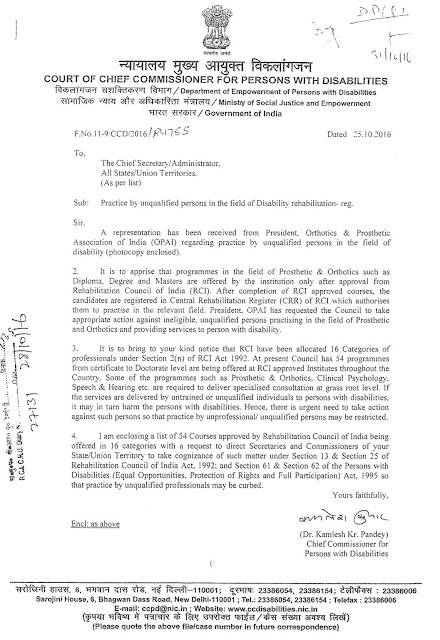 As per the above said order of PWD Chief Commissioner, if any doctor who is not trained as rehabilitation professional and is not certified as such by RCI and he/she persists in rehabilitation services/therapy, he/she would be liable for action under relevant section of MCI and under section 59 of Persons with Disabilities Act, 1995. From the above it is extremely clear that the doctors who may be qualified in their own respective fields, cannot interfere in the rehabilitation services and has to refer the disabled patients/persons to a RCI qualified Rehabilitation Professional, otherwise the doctor is liable for action/prosecution. 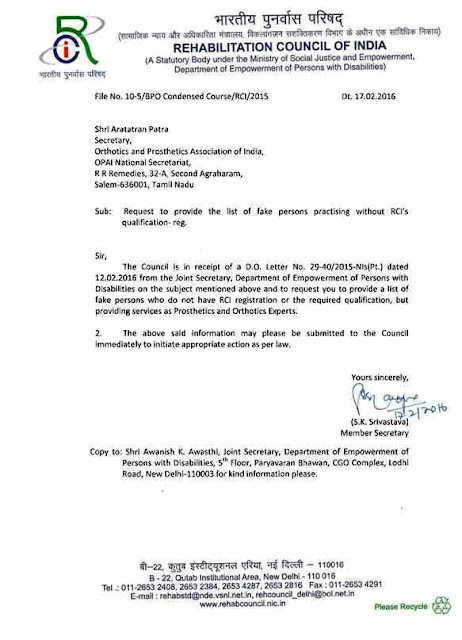 Now, the simple question is that if medical doctors have been restrained through the above order of the Court of Chief Commissioner for PWD and are liable to be prosecuted, how could any person who does not have any qualification, start practicing as rehabilitation professional or self styled 'expert', and misleads the disabled persons. Such quacks & unqualified persons should not be allowed to exploit the disabled persons and mint money from them, for example, in the field of prosthetics & orthotics where high tech and costly devices are to be dealt with. Fitment of artificial limbs & orthotic supports to disabled persons are specialised professional task which can be done only by Rehabilitation Professionals in Prosthetics - Orthotics, having qualifications as per RCI Act and duly registered/certified by RCI. Rehabilitation Professionals, Disabled Persons or any individual or a group can take legal action for compliance of above said order of the PWD Chief Commisioner, RCI Act and Persons with Disabilities Act. Any one can take up this issue in the Court of Chief Commissioner for PWD. Necessary legal action should be taken against Govt. institutes, NGOs, clinics and shops who are promoting unqualified persons/quacks in their establishments to serve disabled persons and provide artificial limbs - orthotics and other rehabilitation services. Under RTI Act the establishments have to provide list of persons serving the disabled persons and their qualifications. High Tech Prosthetic & Orthotic Devices should not fall in hands of Quacks. The liberal policies of Govt. of India have encouraged the availability of world class artificial limbs components and orthotic devices from Otto Bock, Total, Innovative, Ossur, Endolite, Medi, P&O International, and the Indian companies; Alimco, Tynor, Visco, Norma, MGRM etc., so that the disabled patients can now get these state-of-the-art facilities through the Professionally qualified Orthotic & Prosthetic Practitioners. With application of these modern technology and facilities now available in India, there have emerged a number of artificial limbs and orthotic devices which reduces the effects of disabilities and enhances the physical potential of the disabled persons for their physical, social and vocational rehabilitation, which can be ensured, handled and promoted only through professionally qualified Orthotic & Prosthetic Practitioners. Though these companies make due efforts to promote their products through P&O Rehabilitation Professionals, yet due to lack of strict compliance of the provisions of RCI Act and the PWD Act, unprofessional & unqualified persons manipulate their way to even deal in these high tech costly appliances, only to make money and exploit the disabled persons. It has to be ensured that disabled persons who need these high tech Prosthetic Orthotic Devices should not fall in hands of Quacks. As per RCI provisions it is mandatory that only P&O Professionals can handle the disabled patients clinically for fitment of artificial limbs, for which they have to be motivated to provide their patients with high quality products which should be promoted by the above companies through personal contacts, seminars and continuing rehabilitation education (CRE) programmes, which should be conducted for P&O Professionals regularly, and through out the country. 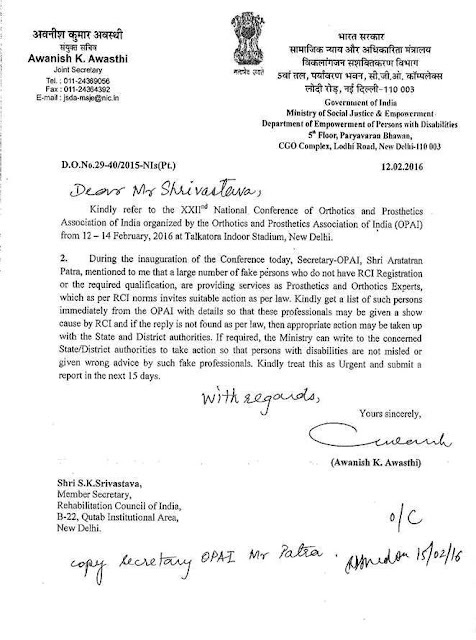 1) Pass necessary directions to Rehabilitation Council of India that the RCI Act is well publicised through out India, on regular basis in print and electronic media. 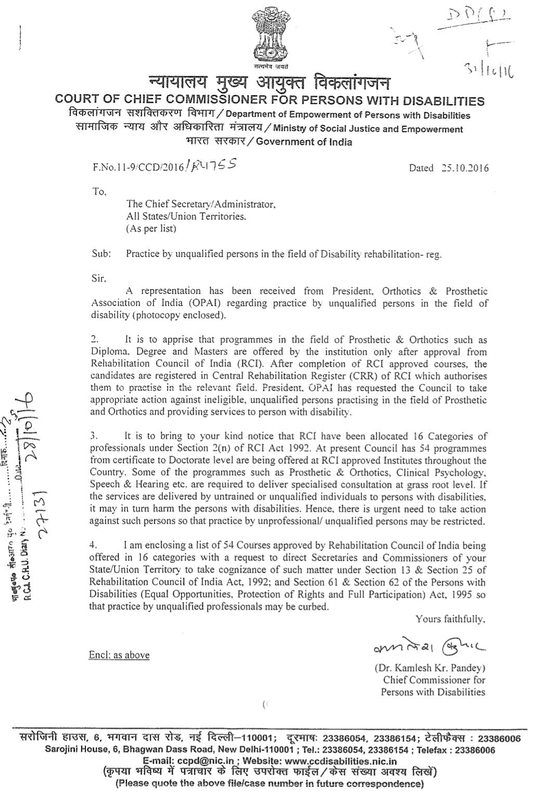 2) Further, RCI should be directed that any complaint received from Registered Rehabilitation Professionals and Qualified Rehabilitation Practitioners should be taken up seriously regarding any individual or the organisations providing rehabilitation services to disabled persons, through unqualified & unprofessional persons/quacks serving and practicing illegally in the field of Rehabilitation, and that immediate action should be taken to prosecute these unqualified persons under section 13(3) of the RCI Act and under section 59 of Persons with Disability Act. The Govt. 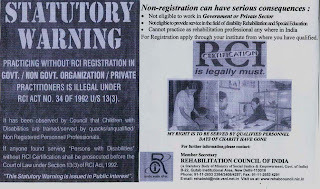 institutes, NGOs, Clinics or any organisation who are encouraging the unqualified persons/quacks to practice as rehabilitation professionals or illegally serve the disabled persons, should also be prosecuted. 3) Further, it should be directed that if any Govt. 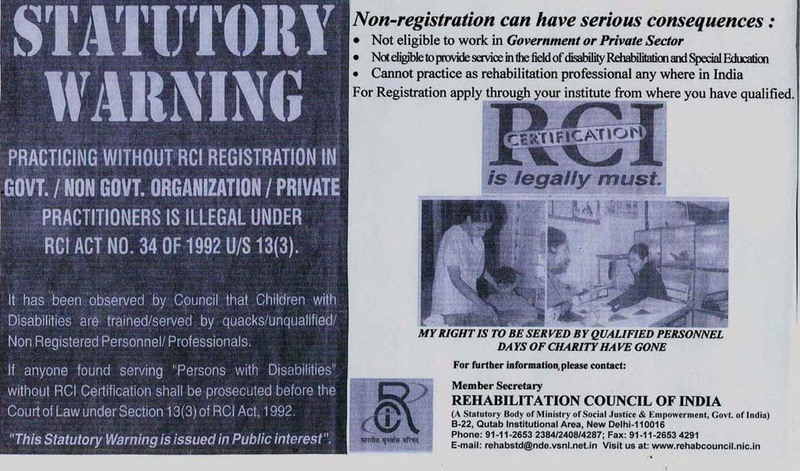 institute, NGO, Clinic or any organisation are wanting to provide Rehabilitation services to disabled persons, they should be restrained from employing unqualified & unprofessional persons, and these establishments should be directed to employ only qualified Rehabilitation Professionals, failing which such establishments should be prosecuted under section 13(3) of the RCI Act and under section 59 of Persons with Disability Act. 4) Qualified Rehabilitation Professionals, Disabled Persons or any person should be at liberty to take up the matter under section 13(3) of the RCI Act and under section 59 of Persons with Disability Act, with the State Commssioner for PWD or in any Court of Law. 5) Directions should be given for the strict compliance of RCI Act in the interest of disabled persons as it is their right to be served by qualified professionals only.